The International Exposition of 1867 (French: Exposition universelle [d'art et d'industrie] de 1867), was the second world's fair to be held in Paris, from 1 April to 3 November 1867. Forty two nations were represented at the fair. Following a decree of Emperor Napoleon III, the exposition was prepared as early as 1864, in the midst of the renovation of Paris, marking the culmination of the Second French Empire. Official bird's-eye view of Exposition Universelle of 1867. 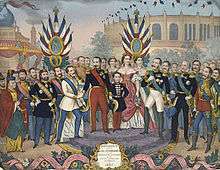 Napoleon III receives the rulers and illustrious men who visited the 'Exposition universelle of 1867". In 1864, Napoleon III decreed that an international exposition should be held in Paris in 1867. 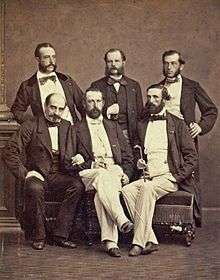 A commission was appointed with Prince Jerome Napoleon as president, under whose direction the preliminary work began. 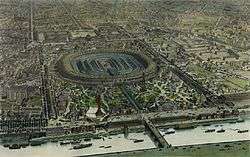 The site chosen for the Exposition Universelle of 1867 was the Champ de Mars, the great military parade ground of Paris, which covered an area of 119 acres (48 ha) and to which was added the island of Billancourt, of 52 acres (21 ha). The principal building was rectangular in shape with rounded ends, having a length of 1608 feet (490 m) and a width of 1247 feet (380 m), and in the center was a pavilion surmounted by a dome and surrounded by a garden, 545 feet (166 m) long and 184 feet (56 m) wide, with a gallery built completely around it. In addition to the main building, there were nearly 100 smaller buildings on the grounds. 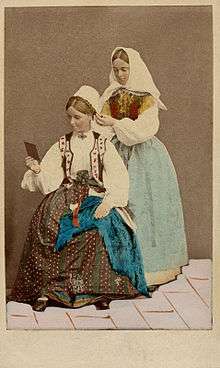 Swedish folk costumes on display at the International Exposition in 1867. There were 50,226 exhibitors, of whom 15,055 were from France and her colonies, 6176 from Great Britain and Ireland, 703 from the United States and a small contingent from Canada. The funds for the construction and maintenance of the exposition consisted of grants of $1,165,020 from the French government, a like amount from the city of Paris, and about $2,000,000 from public subscription, making a total of $5,883,400; while the receipts were estimated to have been but $2,822,900, thus leaving a deficit, which, however, was offset by the subscriptions from the government and the city of Paris, so that the final report was made to show a gain. In the "gallery of Labour History" Jacques Boucher de Perthes, exposes one of the first prehistoric tools whose authenticity has been recognized with the accuracy of these theories. The exhibition also included two prototypes of the much acclaimed and prize-winning hydrochronometer invented in 1867 by Gian Battista Embriaco, O.P. (Ceriana 1829 - Rome 1903), professor at the College of St. Thomas in Rome. A monumental conical pendulum clock by Eugène Farcot (1867), Drexel University, USA. Among the horological exhibits, stood out a monumental model, an elaborate conical pendulum clock crafted by two of France's most important artisans of the second half of the 19th century—renowned clockmaker E. Farcot and sculptor Albert-Ernest Carrier-Be Belleuse. Farcot exhibited several units, one of them it is currently in the Roosevelt Hotel in New Orleans. Its base, which features the clock's face and inner mechanical movements, is carved from solid onyx marble. Atop the base, a bronze sculpture depicting a robed female figure holds a scepter. Rotating soundlessly from the female subject's hand, the scepter provides consistent motion that adds to the clock's sense of grandeur and mystery. From its base to the top of the bronze figure stands at nearly 10 feet tall. Farcot, the most well-known of the French conical clock-makers, established himself in 1860 and mastered his craft over a period of 30 years, helping to popularize the unique pendulum escapement, the mechanism which controls the motion of the inner wheels. Carrier de Belleuse was one of the most important and renowned sculptors of the 19th century, as well as the teacher of Auguste Rodin. In 1857, his bronze sculptures grabbed the attention of Napoleon III, and he was commissioned for several important national works, including his most famous piece, Torchere, which still flanks the staircase of the Paris Opera House. The exposition was formally opened on 1 April and closed on 31 October 1867, and was visited by 9,238,967 persons, including exhibitors and employees. This exposition was the greatest up to its time of all international expositions, both with respect to its extent and to the scope of its plan. For the first time Japan presented art pieces to the world in a national pavilion, especially pieces from the Satsuma and Saga clans in Kyushu. Vincent van Gogh and other artists of the post-impressionism movement of the late 19th century were part of the European art craze inspired by the displays seen here, and wrote often of the Japanese woodcut prints "that one sees everywhere, landscapes and figures." Not only was Van Gogh a collector of the new art brought to Europe from a newly opened Japan, but many other French artists from the late 19th century were also influenced by the Japanese artistic world-view, to develop into Japonism. The Paris street near Champs de Mars, Rue de L'Exposition was named in hommage to this 1867 universal exhibition. Jules Verne visited the exhibition in 1867, his take on the newly publicized discovery of electricity inspiring him heavily in his writing of 20,000 Leagues Under the Sea. A famous revival of the ballet Le Corsaire was staged by the Ballet Master Joseph Mazilier in honor of the exhibition at the Théâtre Impérial de l´Opéra on 21 October 1867. The World Rowing Championships were held on the Seine River in July and was won by the underdog Canadian team from Saint John, New Brunswick which was quickly dubbed by the media as The Paris Crew. Engraving of the Exposition Universelle (1867). The Japanese delegation to the Exposition Universelle. Chinese and Japanese exhibits at the 1867 Exposition Universelle. 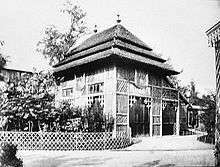 Siamese elephant pavillon at the Exposition. Model of Plongeur, made for the Exposition Universelle (1867). Musée National de la Marine (Rochefort). Commission awarded to one of the members of the (Australian state of) Victoria stand in 1867. M. le Colonel de Salis' CARTE DE SEMAINE, A PARIS valable jusqu'au AVRIL 23. 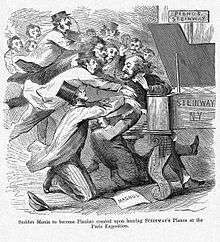 No doubt he was there to visit his brother, William's stand for the Australian State of Victoria. ↑ Memorie dei pi insigni pittori, scultori e architetti domenicani. ↑ "Welcome". Japanese art gallery in Paris - Yakimono. Wikimedia Commons has media related to Exposition Universelle (1867).